Welcome to this week’s Colour of the Week. It’s a regular post here where we shine the light on a particular colour which is having a moment in fashion. I share my edit of what’s currently in store, some tips for how to wear it this Winter and throw it over to you for your styling ideas. So far we’ve covered Navy, Winter white and Shiraz/Mulberry/Marsala. This week, we’re heading back to neutral territory. Usually, black is the dominant neutral in stores come Winter, but there have been a few challengers lately. Early in the season, as Autumn set in, grey ruled the neutral roost. Then black and navy followed. Now, an old favourite is back and making a statement: camel. I am very happy to see this sophisticated hue back in stores. Are you? 1. Megan Cats Eye Sunglasses, $49.95 from Seed Femme; 2. High Neck Knit Shift, $149.95 from Witchery; 3. Metro Huntress Scarf, $89 (on sale) from Mimco; 4. Wool Floppy Hat in Camel, $25 from Target; 5. Rollneck Poncho in Natural Marle, $59 from Target; 6. Camel trench coat, $189.95 from Sussan; 7. Tapered Tie Waist Pant, $129 from Country Road; 8. Vanishing Act Slipper, $179 from Mimco; 9. Cocoon Cardigan, $99.95 from Witchery; 10. Domica Tan ankle boots, $229.95 from Styletread. 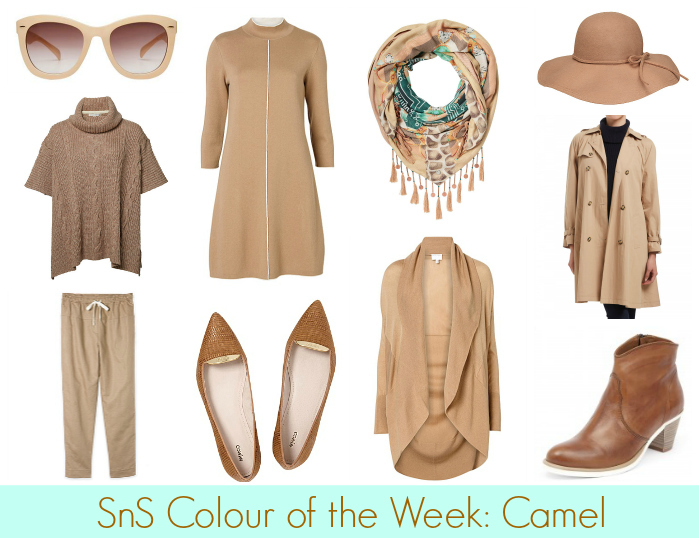 Like grey, camel works as an alternative neutral to black in your wardrobe. It’s warm, light tones are flattering and can also make a refreshing change from some of Winter’s darker offerings too. So how to wear camel this Winter? – Camel works beautifully with denim for relaxed style. This oversized knit (5) over distressed boyfriend jeans is perfect for lazy weekends. – Pair a key piece or accessory, such as a hat (4) or sunnies (1), with black for a classic, understated look. – Introduce your camel with a modern twist – some drapey (7) or drop crotch pants or a gorgeous statement scarf (2). – A camel trench (6) is an all time classic and a smart investment. Dress it up with pointed flats (8) or down with a comfy knit (9) and ankle boots (10). – For something a bit different, try a camel knit dress. I’m loving this flattering Witchery frock (2) for milder climes. If you need more warmth and coverage check out this stunning Cameron knit dress, $199.99 from Sportscraft. This post contains affiliate links. I earn a little commission from a sale but you don’t pay any extra. Do you love a little camel here and there? How do you like to wear it? Any wardrobe staples you’d recommend?